If there’s anything that we at GM have learned over years of making live games, it’s that no design survives contact with the real world — and real players. You can scope out your venue for hours; bounce every last idea off your colleagues; polish your game mechanics until you’re sure they positively gleam. You can create an ironclad rule set and the cutest sheet of how-to-play instructions — and all of them will assure you that your game will be be a Tight, Fun Experience. And then you’ll take your Tight Fun Experience out into the world, to be played by actual, human people. People who do unexpected, human things, like inventing new rules, or sitting on a stranger’s lap to win a classed-up game of rock-paper-scissors. If, like us, you’re running your game in a public space, you’ll also be faced with the unwitting strangers circulating around your players: people whose actions change the landscape of your game, even if they’re not playing it themselves. It’ll be messier than you think. You’ll have to improvise on the fly — react to your players, and to any unexpected events. Bits of your Tight Fun Experience will fall off or not go the way you thought, and you’ll patch them up with whatever you think is most fun at the time. In the end, you’ll have a game that you realized was never perfectly designed in the first place — but if you’re quick on your feet, it’ll still work. If you’re really lucky, it’ll work better. 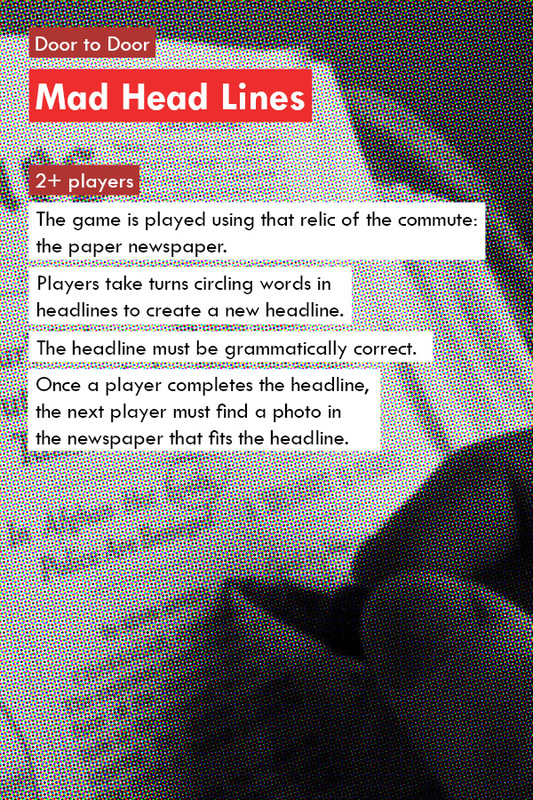 We re-learned this firsthand a couple weeks ago, while designing some brand-new games for public transit — with our friends Mark Heggen from AMC Networks, and Josh DeBonis and Nik Mikros from BumbleBear Games. Back in November, we used Grand Central and the 6 Train subway as our headquarters for an impromptu game jam, and came up with three game ideas that provide new ways to experience a subway ride. Returning to the station to run those games for the public — at the height of the holiday season — was just as fun, but a far different experience than we predicted. When we originally toured through the subway to hammer out our games’ rules, it was Sunday in late November: not many people on the move, and not many people in the train cars. By the time the event date rolled around, though, there were busy holiday shoppers and a crowd of increasingly inebriated amateur Santas to contend with. Mechanics that we’d originally designed in mostly-empty train cars worked quite differently when the space was packed with bystanders, as our intrepid players discovered firsthand. While You Were Dreaming, a solo game where players close their eyes and remember as many details as they can about their train car, was actually even better than we expected with more people around. Without room to sit down, players had to stand in the middle of the car with their eyes shut, feeling shoppers with large bags and tourists whispering directions bustle and swarm around them. The extra crowds induced a much more immersive experience, and one that pleasantly surprised players each time they opened their eyes. Swap Hangers didn’t fare quite as well in the field. That game was built around a rock-paper-scissors-style competition between players holding the subway’s overhead bars, players holding vertical posts, and seated players. With bench space at a premium, though, the game’s central mechanic fell apart: aside from the “sitting on a stranger’s lap” incident we mentioned earlier, it was just too hard for competitors to grab a chair. Our players ended up fixing this game themselves. In a moment of improvisation, they decided that standing without holding any bars would work the same as sitting down — adding a new type of balance to the game, in a very literal sense. So, aside from the fact that playing games in the wild always changes their design one way or another, what did we learn? 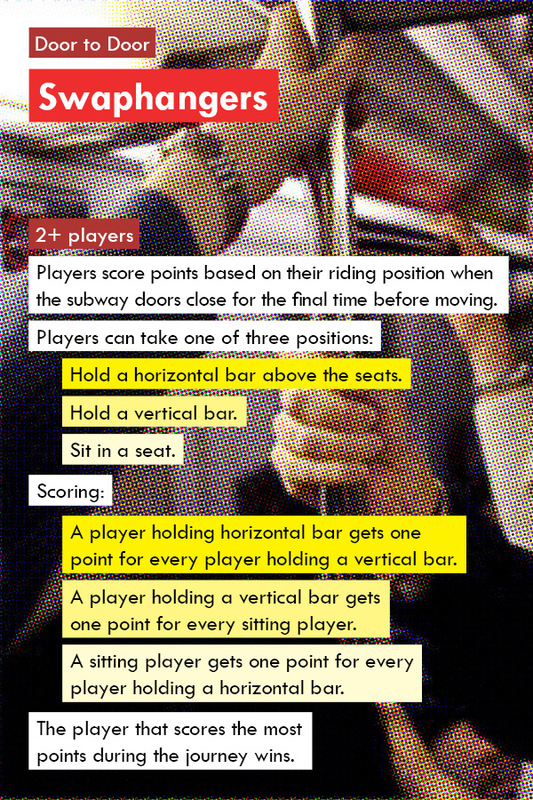 For one thing, that subway games like these need to have especially light, adaptable rules — even more so than other live games. Commuters aren’t looking to sit down with Settlers of Catan on their way to work: they need a short, freeform experience, where the focus is more on seeing their subway ride differently than on winning or losing. In circumstances like these, player experience matters far more than complex, consistent rulesets — and as always, if the play-space changes, the rules need to change with it. 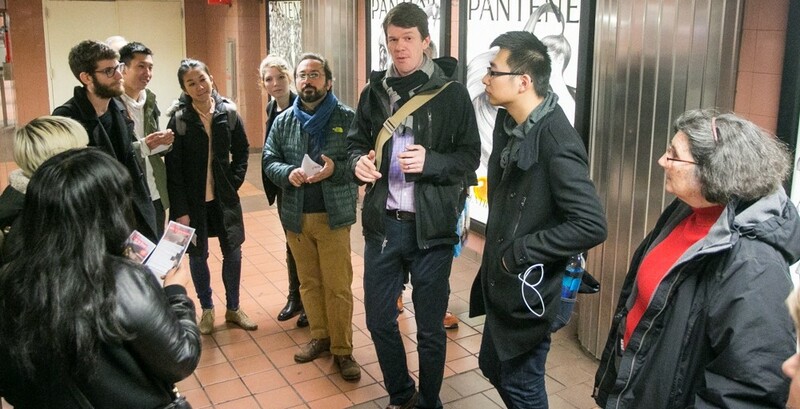 The event was hosted by the Van Alen Institute, as part of their “Door to Door” series on innovation in transit. If you’d like to play the games yourself, you can check out the rules below.